The Gaye label from Atlanta, GA is a treasury of obscure but excellent southern soul. Artists like Ted Ford, Lee Maye, Ernie Wheelwright and the Sheppard Brothers made discs that are highly regarded by the deep soul community – and rightly so. 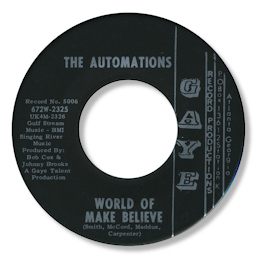 It’s possible the Automations are even less well known than these but World Of Make Believe is right in the same bag. Taken at a dead slow pace this tale of separation is gently – even delicately – sung over some lovely righteous organ and arpeggio guitar, helped by some underplayed horns. Lovely.